Ingram Micro's solid earnings news overshadowed by investors renewed Facebook love affair. NEW YORK (TheStreet) -- Yesterday, Facebook's (FB - Get Report) earnings release and the stock's subsequent run-up dominated headlines, obscuring most other company related news. On the day, Facebook added $19 billion in market cap after reporting better than expected revenue and earnings; an amount that is roughly the market cap of Hershey Foods (HSY. It looks like investors love affair with Facebook love affair is back on, at least for now, even as Facebook users are at least anecdotally becoming weary of the application. I still don't quite get it, but was somewhat amused to see a couple of firms raise their target prices on the stock to the low- to mid-$40's, near where the stock briefly traded on May 18, 2012, its first day as a public company. The more interesting news, to me anyway, came via Ingram Micro's ( IM second quarter earnings release. The company, a member of my BITES BITES portfolio, comprised of seemingly small and cheap technology related names, put up a pretty solid quarter, and finished the day up 10% at $22.81, which is a 14 year high. While revenue of $10.3 billion came in slightly below the $10.4 billion consensus estimate, earnings per share of 55 cents were well ahead of the 46 cent estimate. Ingram has historically been a high volume/low margin business with net profit margins in the 0.7% to 0.9% range. The acquisition of Brightpoint, which contributed $1.2 billion of revenue for the quarter, and is a higher margin business, should ultimately help improve the bottom line. For the quarter, Brightpoint was accretive to gross margins by 58 basis points, which came in at 5.78%, up from 5.15% for the same quarter last year. Consensus estimates for 2014 are calling for earnings of $2.40 per share, putting the forward price-to-earnings ratio at 9.5. While that seems low on the surface, Ingram has historically garnered a relatively low price-to-earnings ratio, averaging about 9.5 during the past three years, primarily due to its low margins. 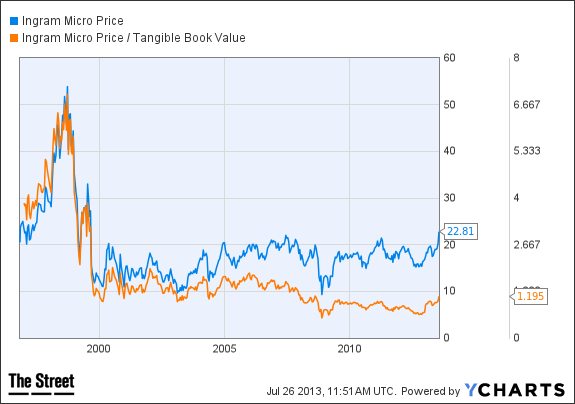 Perhaps the Brightpoint acquisition will ultimately lead to a stronger bottom line, and an expansion of the P/E. It is certainly encouraging to see the stock breaking out of a 14 year trading range. As for Facebook, yesterday's darling, I'll save more comments for a future column. At the time of publication the author is long IM.